Ideal for a weekend breakfast in the Cotswolds. This one was for a business weekend retreat at Meadowbank in Chipping Campden for whom we looked after all the food - at the same time as doing the barbecue birthday at Wellacres and another party at Rectory Park. This was our traditional english breakfast which can be either delivered raw for you to cook or cooked and chilled so all you have to do is heat it up - less washing up for you (and who really wants to wash up on holiday?). Both the bacon and sausages are from Home Farm in Bredons Norton where they rear Berkshire/ Gloucester old spot pigs which make the best tasting bacon and sausages. When I serve them at Upper Court they only travel 3 miles from the farm to the table. 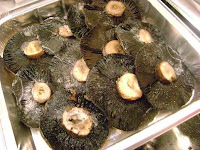 I always get so many good comments about the mushrooms - so much more flavour than regular supermarket mushrooms. They are organic field mushrooms from Oakfield Organics near Evesham. I picked these up at Hayles Fruit Farm while I was buying other things there. They just go in the oven as they are for 10 - 15 minutes. As we were delivering breakfast 2 days running I alternated the potatoes - one day doing the hash browns (left) and the other day potato rosti (below). Photo is from a delivery earlier in the year (hence the date on the box). I first fell in love with the Clarence Court eggs when they sold them in Collins butchers in Broadway - it's hard to find a better tasting eggs. Now the company became so popular they only sell to supermarkets (their delivery lorries are often parked outside here overnight), but they remain as good as they were.